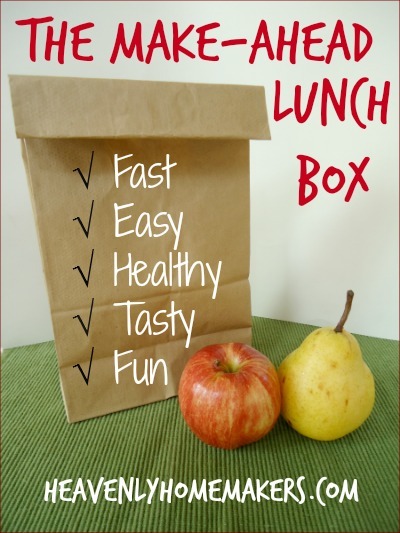 Find all of our Make-Ahead Lunch Box recipes and ideas here. You might laugh at this recipe for several reasons. It is a little different from those I typically share. Yes, hot dogs. Remember how I’ve told you that I really love me a good, all beef hot dog? It’s true. I love sweet peppers, apples, strawberries, and asparagus better. But a good quality beef hot dog tastes really yummy to me. What can I say? Second reason to laugh at this recipe: This is not exactly the most inexpensive recipe I’ll ever suggest that you make. I didn’t find my hot dogs on sale, and I got the best quality dogs I could find at the store that don’t contain nitrites. So…cha-ching. I used real cheese, not American cheese slices, which is obviously, more expensive because it’s real. So if these Lazy Dogs are a little more on the pricey side, why am I sharing this recipe with you? Because these Lazy Dogs taste good. Because they are still less expensive than eating out. Because they are a fun, kid friendly (and apparently Laura friendly) food. And because you can make them ahead of time and put them in your lunch box. Another of our “wraps” are some that we call Lazy Dogs! We boil some hot dogs to plump them up, roll them up with some cheese in a tortilla and heat them up in the oven until the cheese melts! Very good, even cold! I loved the idea and made them for our soccer games and travel that very weekend. Once I had the tortillas made, the boys got in an assembly line to help put the Lazy Dogs together. Just like that, our to-go meal was ready. Boil the hot dogs just long enough for them to plump. ( <— what a weird sentence.) Lay one slice of cheese on each tortilla, top with a hot dog, and roll it up. Bake in a 350° oven for about 10 minutes or until cheese has melted. Make these ahead of time! Warm them in the oven, then serve. We found that we preferred these warm instead of cold. Still, if you want to pack them to-go, simply bake, wrap, and pack. Easy and fun! Are you a hot dog lover? What is your favorite kind? We like Applegate hotdogs- they’re the only ones I’ve found here that are just your basic “real food” ingredients and no junk. Target carries them now, and while a bit pricier than regular hot dogs, they are so much tastier. Even my “health food skeptical” husband will only eat the Applegate and doesn’t like the “cheap” hot dogs anymore. This is a great idea for a quick meal- thanks! That’s what I buy too! No gmo’s here! That’s all I ever make for my daughter is Applegate. Really worth paying a little extra for quality. You can get those hot dogs on sale usually around Memorial Day. When I find a deal on one that I am willing to buy I just throw them in the freezer like the other meat. I like the other poster have started buying the Applegate ones. At least I can tell what most of the food is in them. I have gotten lucky a time or two and found some marked down for quick sale. Thanks for that information going to keep an eye out for them around the holiday to stock up too! I eat these at least once a week. That’s right, me, not the kids. :) I like using a combination of shredded mozz and sharp cheddar the best. And just this week I tried dipping them in ketchup – loved it! We use Hebrew National Beef Hot Dogs, no cheese please. I brown them in the cast iron pan and top with pickle and tomato slices. We’ve wrapped them in tortillas for years. I only buy a couple packages per year and put half in the freezer when I open them. It’s sort of a “bad food treat” around our house. We use the Hebrew National ones exclusively, and have wrapped them in tortillas for a long time (can’t even guess now…at least a couple of years). We love them that way, especially on the weekends or after a hard day at work when cooking just sounds like more work. We like pepper-jack and cheddar on them. We took a break from school this morning and checked the email. What a FUN surprise to see our Lazy Dogs recipe! Ha Ha! I love the cows in a parka name as well! It made all the kids laugh out loud. 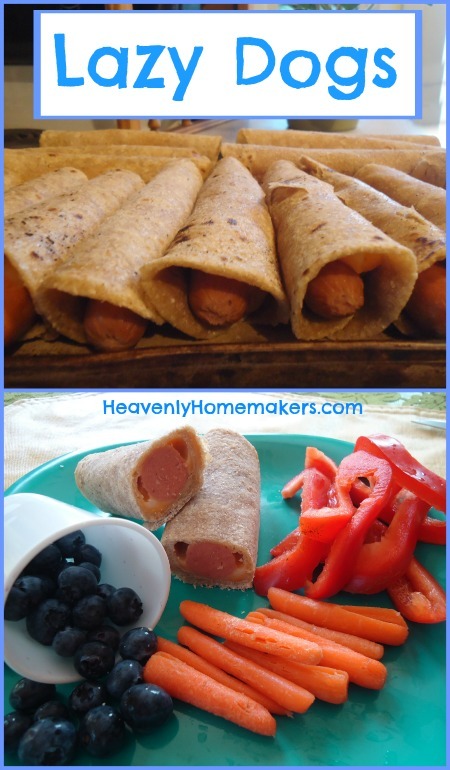 We’ve been eating our hotdogs wrapped in tortillas for several years now ever since we went camping and I didn’t want to buy hotdog buns since my kids won’t eat them. We did want hotdogs while camping so I thought I’d try tortillas. Worked wonderfully and now we won’t eat them any other way. Never tried making them ahead of time and freezing. What a great idea. Will have to try that soon. Nope, not a hot dog lover. I can’t tolerate the texture and they literally give me a headache after eating them, so I just don’t do it. My family, however, likes them. If we have leftover grilled hot dogs and buns, I cut everything into bite size pieces, add some leftover – or from the freezer (thawed) – chili, and some shredded cheddar cheese. Mix it all up, put it in a casserole dish and bake until bubbly! This mixture (minus the buns) also makes a great pizza topping (and another good way to use up leftovers). Hi Laura! I love your blog. Thank you for sharing. I am a mom of boys also. We’re having our 3rd boy on January 16th(ish). I would like to share our guilty pleasure with hot dogs. I’ve purchased the no nitrates coleman and they’re really good. We heat our dogs (in a pan or in boiling water) then we heat our corn tortillas just so they don’t break when we wrap them. We heat up oil in a pot. About an inch high. Then we wrap a hot dog or 1/2 hot dog cut lengthwise in a corn tortilla and hold it together with a toothpick. When the oil is hot (not smoking, make sure it’s medium high, so they don’t burn) add your corn tortilla wrapped hot dogs. Be sure not to crowd the pan. Then turn them over until they’re nicely brown on all sides. Drain on paper towels. Then serve with guacamole, sour cream, salsa, shredded cheese, etc… We call these Mexican Hot Dogs and they’re so delish! Make sure you serve them with plenty of fruit and vegetables, so it balances your meal. Hope you enjoy them as much as we do! Hello Gregory Grookett here and wanted to thank you for this post as a single father I am always trying to find new ideas for making a meal for my daughter who is four. I recently made these over the weekend and they were a big hit. Another person Beth also commented above about using Applegate hotdogs and that’s all we ever eat as well when we do eat dogs. A package lasts us a bit as we eat them as a treat meal on weekends or during a Friday movie night where I relax a little bite on watching what we eat. again just wanted to say I find this site very helpful in finding new and exciting things to try some healthy and some not but hey you have to live a little. Sincerely your loyal follower Gregory Grookett. I made these again this past weekend for my daughter and niece and they love them so much this will be a go to dish in a pinch for awhile around here! Gregory Grookett my kids love them too! I love them. Especially with chili and slaw. The whole wheat tortillas still work perfectly. Bratwurst with peppers and onions too. Yum!